Walther PPQ M1 5” Gold Barrel with Ported Slide. It is widely accepted that the Walther paddle magazine release is the fastest, most efficient, reloading mechanism available today. While most consumers in the U.S are accustomed to a button release, the awareness of the paddle release and its advantages is growing. The new PPQ M1 5” includes the standard PPQ trigger, the undisputed best factory trigger on a striker fired pistol available today. The new Walther PPQ M1 5” comes with an upgraded red fiber optic front sight, just like the Walther Q5 Match. 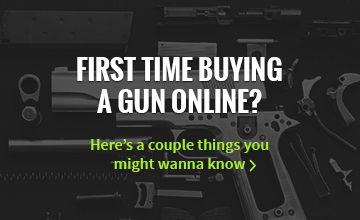 It also comes standard with one 17 round extended magazine and one standard 15 round magazine. 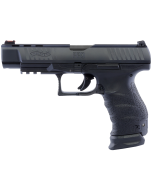 The PPQ M1 5” features the PPQ polygonal rifled 5” barrel. 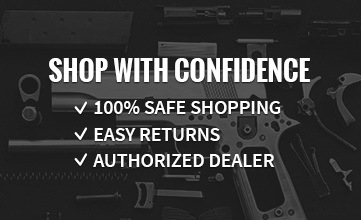 Firearm carries Walther's Legendary Limited Lifetime Warranty. *Custom PVD coating is covered for a period of 2 Years from date of purchase by Gunbuyer.com.